With the tight competition in the freelance WordPress development space, you shouldn’t expect paid work to just fall in your lap. You need to go after it. But finding clients and sourcing consistent work is a challenge. Especially when you’re just starting out and you haven’t developed a network of connections you can tap into. So in this post, we’ll explore some of the tactics you can use to create a steady and diverse stream of clients and projects. Several SaaS startups have been built on cold pitches and even you can start and run a thriving freelance WordPress development business with just cold pitches. Yes, a lot of people balk at the idea of sending cold pitches. They say it’s intrusive, pushy, and so on. But what these people don’t understand is that cold pitches don’t have to be “salesy” when done right – and a client who needs your services will actually appreciate you reaching out. It’s no fun when potential clients don’t reply. Yet these setbacks shouldn’t stop you because while you may get rejections, just one positive response could get you work and potentially more work through word of mouth. Don’t think of all the people who use WordPress as your prospects. To find quality prospects, you need to focus sharply on your niche. For example, if you’re a WordPress developer who specializes in building online stores, your prospects would be people who run their stores on WordPress using a plugin like WooCommerce. A quick way to find some of these people is to visit WooCommerce’s website and check out the customer showcase section. So, they could have plugin development and customization needs you could fill. The first three categories are potential clients (the fourth is not), but category #2 and #3 are your best clients – the low hanging fruit. Now instead of WooCommerce, pick some other WordPress eCommerce product. In fact, repeat this process for all the popular WordPress eCommerce products and you’ll likely end up with dozens, if not hundreds, of prospects to reach out to. You can rinse and repeat this process for any kind of WordPress development service. Just think of the products your potential clients could be using and visit the different product sites for prospects. The next thing you need to do is search for the contact information for your potential clients. It’s best if you can find the site admin’s email because contacting the admin will mean that the right person will read your pitch. If you can’t find the right person to contact via email, use the contact forms on the website. The last and the most important part of cold pitching is the actual cold email itself. Ironically, an effective cold email is one that doesn’t look like a cold email at all. It reads as if the person who’s sent it took the time to get to know the recipient and their needs. So, to get the cold email part right, you need to study the prospect’s website: Look for things like an outdated WordPress version, outdated plugins/themes, slow loading times, or error messages. Also pay special attention to issues that a client cares about like security (outdated products), speed (slow loading times), and missing functionality (that could boost sales/business). Once you’ve found such an issue with a site, write a short email of how you could improve the client’s website and what it could mean for them. Teaming up with complimentary service providers or agencies in another way to gain work. For example, if you’re a WordPress developer specializing in building online stores, you could partner with a designer who specializes in online stores. Or you could partner with agencies that offer WordPress design and WordPress services and specialize in online stores. As you can see, the first result page itself brings up many potential leads for partnerships. Ideally, before contacting these businesses you should put together a spreadsheet and list all of the agencies you find. This way, you’ll be able to track your outreach as well. You can fill your spreadsheet manually or with a Chrome extension like Data Scraper. Basically, Data Scraper lets you scrape data from Google’s search result pages and download it as a spreadsheet. In addition to Google searches, you should also check out the listings in the “Web Site Design & Development” section of platforms like JustDial. Code Poet, too, lists a handful of web design and development agencies and independent consultants you can partner with. You seem to be doing some great work in [niche]. Just wanted to tell you that I’m working in [niche] freelance development and I specialize in [service]. If you ever need a hand with any project, just let me know. Would love to help! You could also partner with fellow freelancers because they too pass work on to each other when busy. In fact, Freelancers Union found about 81% of freelancers refer work to fellow freelancers and about 51% team up on projects. Your past clients are potentially some of the best sources for finding and securing future work. So reach out to them and ask them to recommend you to their connections who could use your services. Subject line: Know someone who could use my service? Just wanted to check in and ask if you could recommend me to any of your contacts who could use my services. As you know, referrals make great leads. So, if you know someone who could benefit from my service, I’d really appreciate an intro. I’d be very grateful for your favor. Just copy this email and send it to ALL your past clients. If you have the time, make this email even more effective with these power tips. 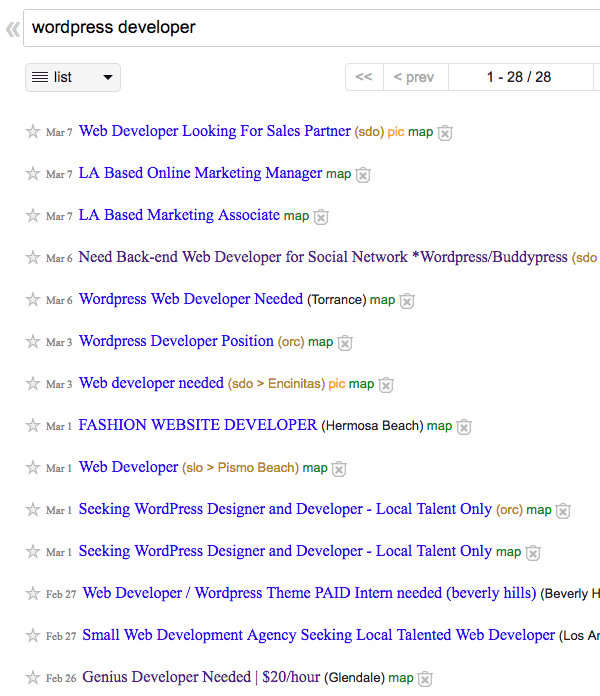 Job boards are always full of hot leads. But to make the most of these leads, you need to have a speedy application process. Which means you should stay updated about new jobs and once you see a relevant ad, you should be able to quickly write a winning application. To get started, add a bookmark folder to your web browser and call it “job boards” or something similar. Next, add these 15 WordPress job boards to it. And add these job boards as well. And then add more job boards as you come across them. Now each time you want to check out these job boards, all you need to do is open all the bookmarks in this folder, which you can do with a single click. Not only that, the entire process of scanning jobs will take under 5 minutes. In case you find a listing that you can’t commit to right away, for example, if you like a part-time gig but aren’t sure about it, add it to your prospects list. Who knows you might reconsider in future… and you’ll still have the application instructions if you take note now. Remember, when you need work, you need to tap all sources. Even Craigslist. Luckily you don’t have to manually search for every city in the world. Just go to SearchTempest and fine-tune its search engine to search every Craigslist listing for your keywords. An example of a SearchTempest search. Also, add Twitter to your job boards folder because a lot of people post about openings on their blogs rather than job sites, and then tweet about the posts. If you try looking for a keyphrase like “hiring a WordPress developer”, you might find some interesting listings. In addition to job boards and crowdsourced platforms like Upwork and Freelancer, clients often use platforms such as Codeable for hiring experienced and expert-level WordPress developers. Which means if you list your services on such platforms, you could get hired for some great projects. Because these websites have a highly vetted talent base, you’ll be required to pass screening tests or interviews. If you aren’t sure about your skillset right now, consider applying to these after a year or maybe two. Generally, the projects on these platforms pay well – so they could bring lucrative business whenever you’re ready. Codeable: Codeable is home to the top 2% WordPress developers, which means you’ll stand a chance on this platform only if you’re an expert-level developer. Crew: Crew is another source for select freelance developers. Toptal: Toptal is another vetted directory of freelance developers. Again, you need expert-level skills to get onboard this one. You might think that once you develop advanced or expert-level skills, you’ll likely not need such platforms but the thing is that most of the clients who hire via these platforms trust the platform and that’s why they choose it in the first place instead of finding and working with a contractor directly. So, don’t discard these options! Speaking at WordCamps and Meetups puts you on the radar of lots of potential clients, partner agencies, as well as fellow freelancers. And this can result in an influx of clients. But to make the most of a speaking session, you need to prepare – not just for a stellar presentation that offers value, but also for networking. So don’t just show up with a shiny presentation, take the time to find out about the people who are sponsoring the conference or speaking, or simply attending. This small exercise will help you connect with a lot more people. Also, if you meet someone at a WordCamp, you can further personalize your email when you reach out to them sometime later. So look for the upcoming WordCamps and meetups (or niche conferences) that you can attend and give a talk at. Once you register for an event, make sure to check out the sponsors, speakers, and attendees. This will be incredibly helpful for connecting. It’s okay if you aren’t a superstar speaker right from the go; you can improve with each presentation. Unfortunately, all commercial keywords like the “best WordPress BuddPress developer” have high competition, so it might be a while for you to get to the top, if at all. But you can gradually start ranking for some of the keywords that your clients might use to search for you. 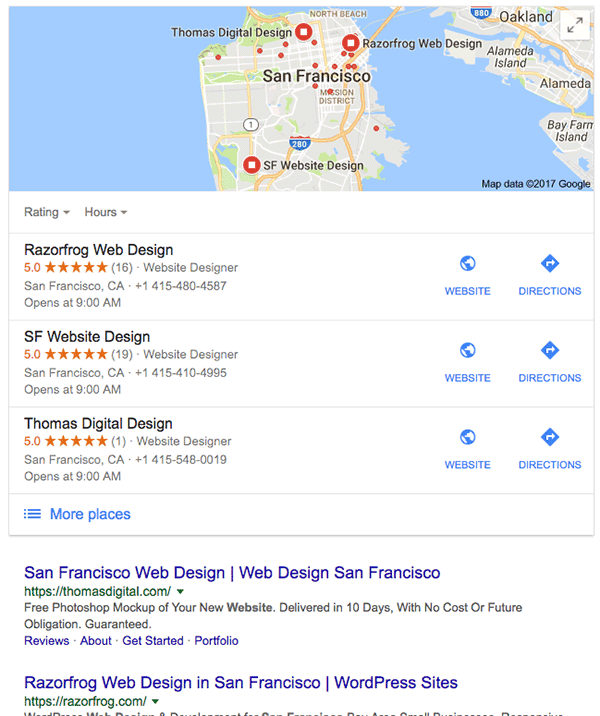 To get there, start by following these SEO steps. If you want to grow your client list and get steady, consistent work, bookmark this page, go through each of the tactics and then rinse and repeat. In fact, set a daily reminder for yourself and keep 15 min every day for just these business development activities. If you follow these tactics you’ll soon reach a point where clients will start contacting you about your services. But you need to work toward that – it’s not going to happen on its own. How do you make sure that you get consistent work? And have you used any of these tips to get work? And what was your success like? What other tactics do you use to source work? Share in the comments! Disha Sharma: View a list of posts by this author. Disha Sharma is a freelance writer specializing in digital marketing. Check out her website or connect with her on Twitter. “You got to see them to sell them” , so being at local business groups and meetups will give you a chance to be seen by local business owners. The sort that go to these meetings are usually the best conected too, which is great for a referal later. I agree. When starting out as a freelancer, I relied mostly on word-of-mouth networking to acquire new leads. This led to joining several meetup groups in my area to discuss coding practices, and to work on development projects. As time went by our these groups narrowed in focus, until a few of us began working as more of a development team than a meet and greet chat session. Now we work for the same company and really enjoy the sense of shared responsibility…shared reward. Belonging to a business network is one of the best ways to get the word out there. I have used them in the past myself and they are very effective.